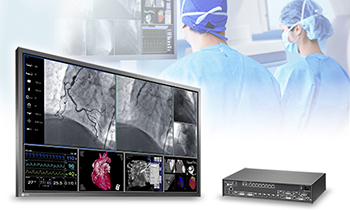 Hakusan, Japan, May 16, 2014 – EIZO Corporation (TSE: 6737) announced that it has expanded its FDA 510(k)-cleared large monitor system with the addition of the RadiForce LS580W monitor and LMM0802 large monitor manager for interventional radiology and surgical suites. In 2011, EIZO received FDA 510(k) clearance from the U.S. Food and Drug Administration for the RadiForce LS560W monitor and LMM56800 large monitor manager. With the introduction of the monitor’s successor model, the RadiForce LS580W and the LMM0802 large monitor manager as an alternative component, EIZO’s FDA-cleared large monitor system now offers additional options to medical professionals while continuing to provide a high level of customer assurance. In the operating room and interventional suite, essential information such as X-ray, endoscopic images, and EP (electrophysiology) is typically displayed using several different monitors. The RadiForce LS580W is a large 58-inch widescreen monitor with 4K ultra HD display for viewing a variety of essential medical information on a single screen. This allows users to view important information consistently and conveniently in one location. With the LMM0802 large monitor manager, users can scale and position several source video windows to suit their preferences and working conditions. This flexibility allows surgeons and interventionalists to easily optimize their workflow. Founded in 1968, EIZO is a leading global manufacturer of high-end visual display products. The image quality, long-term reliability, and innovative features of EIZO monitors make them the products of choice in many financial trading rooms, back offices, hospitals, air traffic control centers, design studios, and eSports organizations throughout the world. EIZO is represented in over 70 countries and regions by a network of group companies and exclusive distributors.